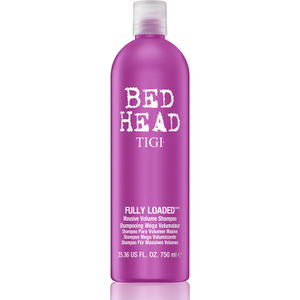 Transform limp, lack-lustre hair with the TIGI Bed Head Fully Loaded™ Massive Volume Tween Duo. Combining a volumising shampoo and conditioner, you can create full, luscious locks every time. A lightweight formula dedicated to delivering enviable body and bounce. Developed with a unique Foam Cleansing System, the shampoo gently eliminates impurities and product build-up, whilst innovative Uploader™ technology creates superior definition and instant va-va-voom. Infusing hair with a delicious berry fragrance, you can expect long-lasting volume memory that won't drop out. A body-boosting formula to revitalise, plump and thicken strands from root to tip. Fortified with innovative Fibre Thickening Technology, the conditioner penetrates deep into the hair fibre, causing it to swell and thicken as it moisturises, revealing a fuller-looking appearance without added weight. Expect beautiful, bouncy locks with enhanced definition, volume and the brand's 'Full Blown Berry' fragrance. Shampoo: Lather up in wet hair focusing on the roots. Rinse away and follow with conditioner. 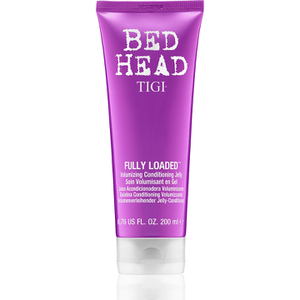 Conditioner: After washing with Fully Loaded™ shampoo, apply to mid-lengths to ends then rinse. Shampoo: Water (Aqua/Eau), Sodium Laureth Sulfate, Acrylates Copolymer, Cocamidopropyl Betaine, Sodium Chloride, Glycerin, Fragrance (Parfum), Carbomer, Punica Granatum Extract, Paullinia Cupana Seed Extract, DMDM Hydantoin, Guar Hydroxypropyltrimonium Chloride, Citric Acid, Disodium EDTA, Sodium Benzoate, PEG-45M, Propylene Glycol, Silica, Alcohol Denat., Red 33 (CI 17200), Yellow 5 (CI 19140). Conditioner: Water (Aqua/Eau), Glycerin, Polyquaternium Crosspolymer-3, Fragrance (Parfum), Dimethicone, Mineral Oil ( Paraffinum Liquidum/Huile minérale ), Cetearyl Alcohol, Behentrimonium Chloride, Dipropylene Glycol, Amodimethicone, Polyurethane-39, Sorbitan Oleate, Trideceth-6, C11-13 Isoparaffin, Disodium EDTA, Phenoxyethanol, Paullinia Cupana Seed Extract, Punica Granatum Extract, Cetrimonium Chloride, PEG-7 Propylheptyl Ether, Magnesium Nitrate, Benzyl Benzoate, Phenylpropanol, Propylene Glycol, Methylchloroisothiazolinone, Propanediol, Caprylyl Glycol, Magnesium Chloride, Methylisothiazolinone, Alcohol Denat. (SD Alcohol 40-B), Red 4 (CI 14700), Yellow 5 (CI 19140).